Model TS 2380 is the perfect "couple's coach!" Take off on a weekend get-a-way and have the option to stop wherever you like because your living and sleeping space is attached to your vehicle. You have a double bed in the rear to rest your head at night with an area for you to add the optional TV. There is a two person dinette to play a game or eat a snack/meal and a kitchenette with a convection microwave to help prepare those snacks. The full bathroom has a shower, a toilet, and a sink, so you have all of the main necessities on your travels. When you want to breathe in some fresh air without getting a sunburn then head outside and relax underneath the 15' power awning with LED lights so that you can keep the good times going even at night! Forest River Sunseeker TS class C motorhomes are built with eco-friendly building materials making them ultra-lightweight and fuel efficient. The exterior has tinted frameless windows and a gel coat making these units look shiny and sleek. There is an outside shower for cleaning up after a long day of adventures and an upgraded memory foam mattresses for comfort at night. A couple more amazing features that these units have to offer are keyless entry, a color back-up camera, and a 12V LED flat panel adjustable TV, plus a Maxx Air fan in the living room to cool off on those hot summer days. 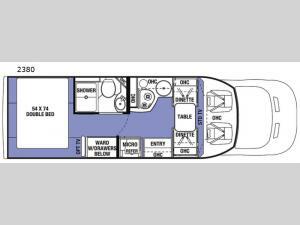 So, come choose the best Sunseeker TS motorhome that suits you!